At Walking Mountains Science Center we are committed to sustainability of the Eagle Valley and surrounding mountain environment. We value the ecological, economic, and cultural health of our community and our valley. Therefore we strive to engage our participants, visitors, and employees in environmental stewardship and learning about the surrounding mountain environment. We also encourage our participants, visitors, and employees to participate in local cultural and educational opportunities that enrich our community’s sense of well-being. Walking Mountains uses a Sustainability Action Plan to set goals and guide our progress and we create an Annual Sustainability Report to communicate and celebrate our successes. By participating in our programs you are choosing to support certified sustainable activities. Kudos to you! To learn more about the sustainability of our organization click here to view our Sustainability Handbook. Walking Mountains is recognized as a Gold Leader in the Colorado Department of Public Health & Environment’s : Environmental Leadership Program. A voluntary program recognizing Colorado entities that go beyond compliance with environmental regulations and reach towards the goal of sustainability. 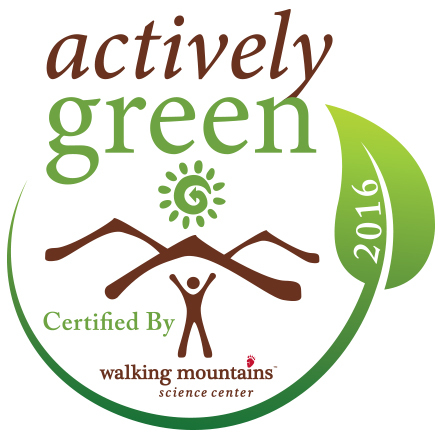 Walking Mountains has be assessed and awarded Actively Green Certification. Actively Green Sustainable Business Certification program helps make sustainability actionable in day-to-day operations. The program concentrates on the 3 P’s: People, Planet, and Profit, while creating a culture of sustainability within any organization. Click here to learn how your business can be certified Actively Green.